The International Road Federation represents its members at highest level and ensures that the voice of the road sector is heard by the relevant stakeholders. The work accomplished in the IRF working groups has helped tremendously to develop our business cases and informed input when speaking with the political instances. At this stage, I would like to thank them and our staff who works with them, for having invested so much energy and know-how into making the IRF what it is today: a recognised organisation that is consulted when it comes to issues touching the road sector. We would like to invite those reading these lines and who are not yet an IRF member, to join us and to be part of THE organisation that successfully represents your sector with political and intergovernmental bodies. The International Road Federation has been chosen to be part of a 25 member strong high level European ITS Advisory Group. 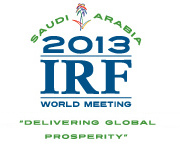 The first meeting of the Advisory Group was attended by Sibylle Rupprecht, Director General of IRF Geneva. Since November 2011, IRF closely collaborates with EasyWay, the joined European Road Authorities and Operators for harmonised implementation of Intelligent Transport Systems (ITS) on the European road networks. The collaboration had been sealed in a Memorandum of Understanding. 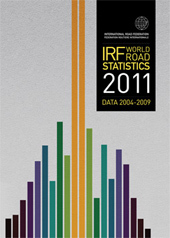 IRF presented RADaR, the road accident data recorder, at the 15th meeting of the UN Road Safety Collaboration. The 15th meeting of the UN Road Safety Collaboration (UNRSC) was hosted by WHO and the World Bank on 16-17 April in Washington DC. Keynote speaker David Strickland, Administrator of the National Highway Traffic Safety Administration (NHTSA) in the United States, provided an overview of progress in the country on the Decade of Action for Road Safety 2011-2020. IRF participated in UNECE Inland Transport Committee, Working Party on Road Traffic Safety (WP.1) sixty-third session which was held in Geneva between 19 and 22 March 2012. During the meeting the consistency between 1968 Convention on Road Traffic and other international legal instruments such as Vehicle Technical Regulations and EU Driving Licence Directive were discussed. UNECE Group of Experts on Adaptation: Your input needed! The UNECE Group of Experts on Climate Change Impacts and Adaptation for international transport networks held its third meeting in Geneva on 24th April 2012. The meeting had as main objectives to continue the exchange of knowledge and experience amongst the members and to finalise the work on a questionnaire for collection of information on existing and potential climate change impacts on transport. Held from 14-16 May 2012, the annual session of the WP.6 reviewed the yearly activities as well as initiated some new information. The UNECE Working Party on Transport Statistics (WP.6) is an intergovernmental body dealing with the development of appropriate methodologies and terminology for the harmonization of statistics as well as the collection of data from member States and the dissemination of these data. The Indian Roads Congress (IRC) is a premier technical body of highway engineers developing specifications, standards and code of practice for road and bridge works. They provide a National forum for sharing of knowledge and pooling of experience on the entire range of subjects dealing with the construction & maintenance of roads and bridges, including technology, equipment, research, planning, finance, taxation, organisation and all connected policy issues. The governing body of the IRC is the Council. We are pleased to announce the arrival of Mr. Dave Elseroad at IRF Geneva. In mid-May, Dave assumed responsibility for IRF’s Geneva road safety activities and supporting the IRF Group of Experts. Barry Gilbert-Miguet will continue to concentrate on a roving editorial/media role as well as to fill in on general promotional/fundraising/marketing materials which will hopefully benefit all the working groups going forward. Dave comes to IRF with a background in international development, advocacy, and public health policy. From 2007 until just recently, he worked for the Washington, DC-based Campaign for Tobacco-Free Kids (CTFK), one of the partner organizations in Bloomberg Philanthropies’ global tobacco control initiative. As the head of CTFK’s Ukraine, Turkey and Poland programs, he directed policy advocacy activities in those three countries. Concurrently, Dave managed a multi-million dollar portfolio of grants to NGOs and governments throughout Eastern Europe, the former Soviet Union, Africa, the Eastern Mediterranean and South Asia. Prior to his work at CTFK, Dave worked on weapons non-proliferation and scientific exchange programs at the U.S. Civilian Research & Development Foundation (CRDF). He also served as a U.S. Peace Corps volunteer in western Ukraine from 2002 - 2004. Dave earned a M.Sc. from American University (Washington, DC) and a B.A. from St. Mary’s College (Maryland, USA).